I’ve started to build a little FM radio with one of this cheap modules with a Phillip chip, the TEA5767. I will control it with a MSP430, probably I’ll use some kind of encoder to change stations and a potentiometer for the volume. The TEA5767 is a single-chip electronically tuned FM stereo radio for low-voltage applications with fully integrated Intermediate Frequency (IF) selectivity and demodulation. Most of the information of this devices is from the datasheet and this app note. The I2C-bus mode is selected when pin BUSMODE (PIN 3) is LOW. The serial interface use pin 1 as SDA and PIN 2 as SCL. The board is powered with 3.3V with VCC being PIN 5 and GND in PIN 6. PIN 10 is there to connect an external antenna (just a piece of wire) and PIN 7 and 8 are the audio outputs. Pins 4 and 9 are left unconnected. First of all let me explain some basics concepts about FM radio receivers in order to understand how to configure the different settings this chip has. I might be oversimplifying some things here, I’m just writing what I’ve read and understood while searching information to use this thing so beware of mistakes! The superheterodyne is a circuit arrangement that is the basis of almost all modern radio receivers. Edwin Armstrong invented in 1918 the idea of a heterodyne receiver. Heterodyning is the translation of a signal from a higher Radio Frequency (RF) carrier signal to a lower Intermediate Frequency (IF). There are three important frequencies in heterodyne RX; RF Radio Frequency, the center frequency the signal is broadcast on; IF Intermediate Frequency, fixed frequency inside the RX (the RF signal is downconverted to this frequency) and LO Local Oscillator, tunable frequency inside the RX used to translate the RF signal to the IF frequency. The mixer uses a non-linear component to produce both sum and difference signals, each one containing the modulation contained in the desired signal. The output of the mixer may include the original RF signal at fd, the local oscillator signal at fLO, and the two new frequencies fd+fLO and fd–fLO. The mixer may inadvertently produce additional frequencies such as 3rd- and higher-order intermodulation products. The undesired signals are removed by the IF bandpass filter, leaving only the desired offset IF signal at fIF which contains the original modulation (transmitted information) as the received radio signal had at fd. The TEA5767 has the ability to work with both high and low-side injection. This is to avoid the problem of image frequencies. Other signals produced by the mixer (such as due to stations at nearby frequencies) can be very well filtered out in the IF stage, giving the superheterodyne receiver its superior performance. However, if fLO is set to fd + fIF, then an incoming radio signal at fLO + fIF will also produce a heterodyne at fIF; this is called the image frequency and must be rejected by the tuned circuits in the RF stage. |(fLO + fIF)- fLO|= 97,95 MHz – 97,725 Mhz =225 kHz= fIF here again the difference is 225 kHz and this other radio station would also be heard, though not as well as the one at 97,5 Mhz because the RF tuned circuits largely remove it. This is the image frequency. You have this two image frequencies at fd±2fIF that might pass through but at least you can choose to have the one that interfere less with the station you want to hear. I’m not exactly sure about how the PLL works but the important thing here is to understand that we have control over the Frequency Divider shown in the diagram. Using a simple formula a 14bit number is calculated (the “k” value) and used in that divider in order to receive a certain station. The device has an I2C serial interface and the data sequence is as follow: address, byte 1, byte 2, byte 3, byte 4 and byte 5, both when writing and reading. The IC address is ob11o oooo. In the third byte the three MSB are used in the search mode, I’m not using it so those three will be set as 0. HLSI is to choose between Low/high side injections. The formula I used to calculate the PLL frequency divider is for a High Side injection setup so that bit has to be set to 1. MS will be at 0 to choose a stereo output instead of mono. MR and ML will be at 0, otherwise right and left channel would be muted. Finally, SWP1 is for a software programmable port which I don’t have access to and won’t be using so I’ll put there a 0. In the fourth byte there is another software programmable port and again this will be at 0. STBY is set at 0 to avoid Standby mode. BL is set at 0 to use the US/Europe band limits (i’m in Argentina). XTAL is set at 1 because the board is using a 32,768kHz crystal. SMUTE, HCC, and SNC will activate different functions with the intention of improving the sound quality, I’ll just ignore them for now and set those three bits to 0. The LSB is SI which is related to SWPORT1 and I can’t use it so, again, 0. In the last byte there are only two bits to configure. PLLREF has to be set at 0 to disable the 6,5 Mhz reference and DTC is 1 to use a de-emphasis time constant of 75us. The rest of the bits are not used. After figuring out what to send to the module I made a simple program and connected the TES5767 to a Launchpad. I’m using a MSP430F2012, the code is built in IAR and I’m using TI’s library for the I2C communication to makes things easier. As you can see in the code there are only a couple of functions. Luckily all the time spent to understand the chip paid off and the radio worked inmediatelly. EDIT: I made a mistake calculating Ndec, I divided by 32678 Hz instead of 32768 Hz. The correct number for 97.5Mhz is 11929 = 0x2E99. 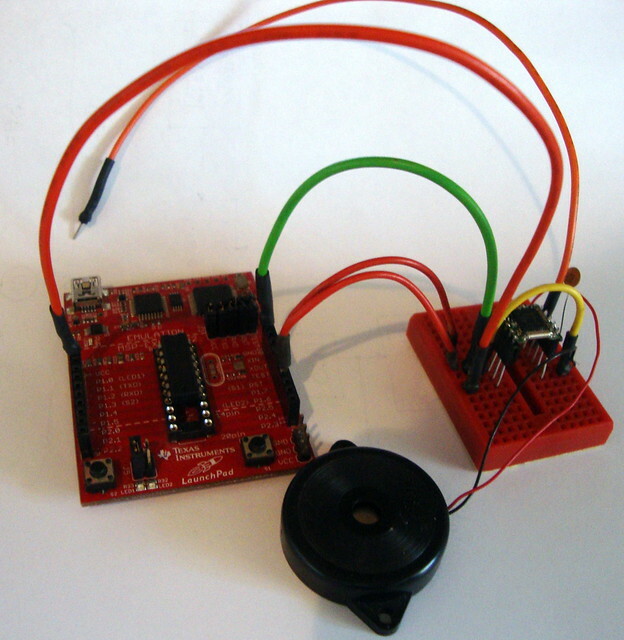 This entry was posted in diy, Electronics, fm radio. Bookmark the permalink. for I2c does the FM module have inbuilt pull up resistors? or does it requires additional? The module need a pair of resistors. 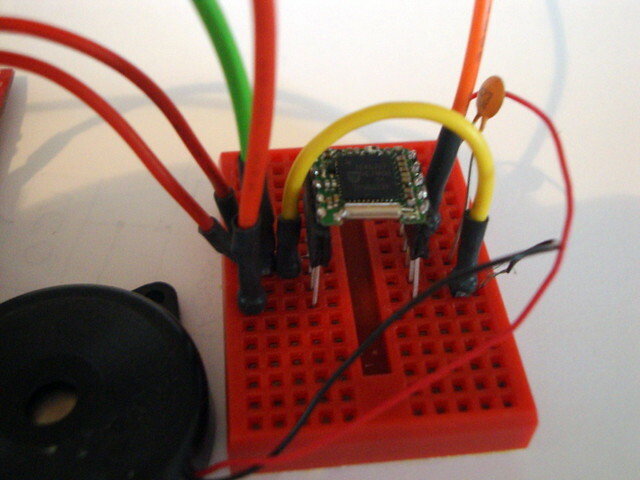 I’m using the MSP430 internal pull up resistors. I used your explanations to get my TEA5767 Devboard running. i find a project on github https://github.com/pcnate , but he only provide some fictions in his python file. wish some one could share demo souce code . I just wanted to point a little mistake on the last schematic, you exchanged P1.7 and P1.6. P1.7 is SDA and P1.6 is SCL. I think pllref bit in byte 5 must be 0 for 32.768 khz pll input. So last byte in your tx buffer must be 0x40 not 0xc0. Yep! You are right. I mentioned that it should be a 0, I screwed up while making the table. Thanks!! Is it possible to hard wire the module to receive one FM station without any programming or extra hardware (apart from audio amp)? Is there any detail info available on this module? I don’t think so. You need to configure the module through I2C bus, not only set the station but also other registers like band limits. Maybe I’m wrong and somebody else know how to do it, if so please share! Help me buy new tools!